A DNA sample from a 10,000-year-old skeleton discovered in Gough Cave near Cheddar Gorge, England, offers a remarkable revelation: the first modern British people had “dark brown to black skin.” According to recent analysis, they also had dark curly hair and blue eyes. In other words, whiteness in Europe is a much newer thing than we thought. The so-called Cheddar Man was a hunter-gatherer during the Mesolithic period, which ended just before the appearance of agriculture. While Britain was populated and abandoned by humans during earlier periods, archaeologists think that humans lived on the island continuously from Cheddar Man’s time through to present day. This is part of what makes the details about his appearance so meaningful. Cheddar Man’s genome shows that Europeans didn’t develop pale skin until a few thousand years ago, rather than tens of thousands of years ago when humans first migrated west onto the European continent. The skeleton itself is the oldest nearly complete human skeleton ever discovered in Britain, though it’s been studied for over a century after being unearthed in 1903. However, the cool conditions of Gough Cave were excellent for keeping the DNA intact. 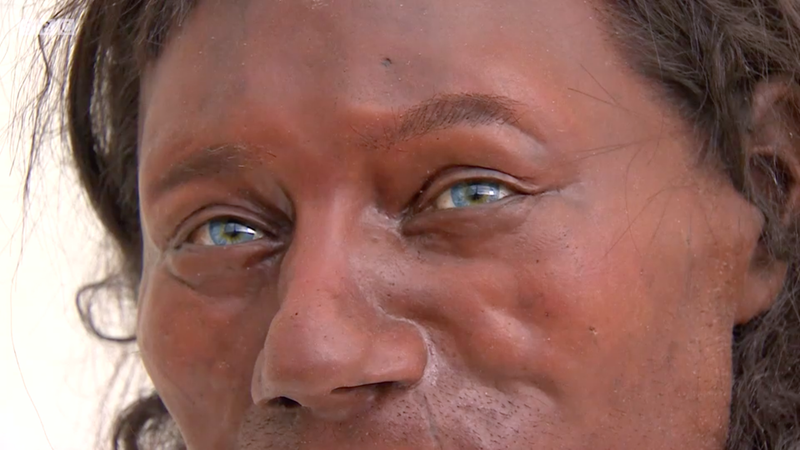 A sample pulled from bone dust extracted from Cheddar Man’s skull provided scientists with a full genome that enabled them to reconstruct the shape of Cheddar Man’s face as well as discover the color of his skin, eyes, and hair. Based on the shape of the skull, a team of model-makers reconstructed Cheddar Man’s face with a 3D printer. The reconstructed bust shows an early human that looks similar in appearance to Paleolithic Africans. This suggests that the population moved from Africa through the Middle East, then across Europe and onto Britain thanks to the Doggerland land bridge, which connected the continent to the island during the time Cheddar Man was alive. Scientists say that DNA from the Cheddar Man population can be linked to about 10 percent of the genetic make-up of modern Europeans. To be more specific, archaeologists now think that what changed the skin color of Europeans over time was not simply migrating onto the continent. It was probably the advent of agriculture. However, the rise of agriculture meant a change in diet and lifestyle for humans in Europe. Perhaps because they weren’t eating as much vitamin D-rich protein like fish, humans adapted to the cloudier environments of areas like Britain and Scandinavia by developing lighter skin that could help them produce more vitamin D. Skin color, in other words, is just as much the result of changing conditions and lifestyle as it was migrating from one part of the world to another. Perhaps what’s most remarkable about this Cheddar Man news is a difficult truth. Cheddar Gorge is indeed the birthplace of cheddar cheese, but despite his name and his origins, Cheddar Man could not eat cheese. He was lactose intolerant.